Bandh called by United Action Committee from Lilong to Wangjing in Thoubal district from September 14 to September 15 has not revoke as of now as no understanding between the DC of Thoubal District and the committee member. The band is also supported by the affected people of Wanhjing while widening the National Highway 102 as agreement reached between the former Dc and the affected people is reported to have not been respected by the present DC. Village authority of Ringui in Ukhrul district has donated 600 acres of land to Forest department for protection of Environment. Lauding the gesture of the villagers Forest and Environment Minister Th. Shyamkumar said that village authority of Ringui has set an example on their commitment to save the environment. “God created different places and environment but human race exploited it for their own benefit”, Shyamkumar said. He said the Forest department is committed to save the environment at different locations of the State and the department respects the villagers of Ringui who have donated the land for conserving the environment. The Forest and Environment Minister Th. Shyamkumar said the above statement during an inaugural function of a community hall at Ringui village at Ukhrul district today. Shyamkumar appealed the people to protect the forest and environment and also to extend their support to the authority of the Forest department in preserving the natures’ gift. “ Officials of the Forest department is visiting nooks and corners of the State to spread awareness to conserve the environment and combat the climate change which is the biggest threat faced by the world, but without the support of the villagers it will be a hard task for the official in saving the environment. The Minister also assured to take up various schemes for the development of the village. Ringui village is a plastic free village and it has official dumping site. The Forest Minister was impressed to learn it. As part of the function, a CD containing Ringui Horei song was released and a documentary was also shown to the audience. Land donors were also felicitated at the function. The function was also attended by officials of Forest and Horticulture & Soil Conservation Departments. Education Minister Thokchom Radheshyam today visited The Sangaiyumpham Higher Secondary School, Sangaiyumpham and interacted with the staff. The Minister inspected the three new school buildings constructed at the adjacent side of the previous building where the staff and students had been recently shifted. After enquiring to the staff the Minister learnt that out of the three school buildings one of the building was being occupied by locals. He warned the locals to vacate the school building within five days. Inspecting the school premise the Minister also suggested demolishing the concrete fencing separating the three school buildings. He said the demolition of the walls constructed between the school building would enlarge the school campus enabling the students to move freely and utilizes the ground for assembly and other sports activities. Expressing displeasure on seeing the poor maintenance of the staff rooms and school premises, he asked the principal and staff to bring academic atmosphere in the institution since it has been already a month being shifted to the new building. Radheshyam who is also the MLA of Heirok A/C visited the Government Primary School, Heirok part II. Regional Institute of Medical Sciences (RIMS), Imphal established in the year 1972, is celebrating its 47th Foundation Day on 14th September, 2018. RIMS, Imphal has significant contributed in the field of medical science by imparting Undergraduate, Post Graduate and other courses, and catering to the health care needs of the country particularly North Eastern Region as a tertiary medical institution. The following course are offered in RIMS Imphal MBBS (100 seats / year), PG course in 23 disciplines (147 seats / year), M.Ch. course (2 seats / year), M.Phil Clinical Psychology course (6 seats/year), B.Sc. Nursing (50 seats/year), B.D.S. (50 seats/year), BASLP (Bachelor of Audiology and Speech Language Pathology) course (10 seats/year). Cardiology, Neurology, and GIS & MAS has upgraded to full-fledged departments in 2018. RIMS, Imphal has catered to 3,95,527 Nos of OPD patients, Casualty – 1,21,236, indoor patients – 42,888, 7,245 (major) & 4,595 (minor) surgical operations and 11,645 deliveries were conducted in the last one year. A statement by Dr. R.K. Lenin Singh, Chairperson, Publicity Sub-Committee, of the foundation day celebration said that Smt. Anupriya Patel, Minister of State, Health & Family Welfare, Govt. of India inaugurated Digital Payment System in RIMS Hospital on 31st May, 2017. The Ministry of Electronics & IT, Govt. of India has complimented and selected RIMS, Imphal along with AIIMS, New Delhi for interaction with the Minister Shri Ravi Shankar Prasad with persons availing benefits of e-Hospital for easy excess of health facilities. Under this program, Online Registration System (ORS) facility is available to OPD patients through website www.ors.gov.in. RIMS, Imphal is also implementing various schemes and programs of the Ministry of Health & Family Welfare, Govt. of India such as Janani Shishu Suraksha Karyakaram and availing Direct Benefit Transfer to the beneficiaries, it added. The statement also stated that the Chief Minister-gi Hakshelgi Tengbang (CMHT), Govt. of Manipur scheme is fully implemented in RIMS Hospital. This scheme is a pioneering health assurance scheme initiated by Govt. of Manipur which provides Rs. 2 Lakh per eligible families every year. RIMS is prepared to implement Ayusman Bharat-National Health Protection Mission which will benefit upto Rs. 5 Lakh per family per year. 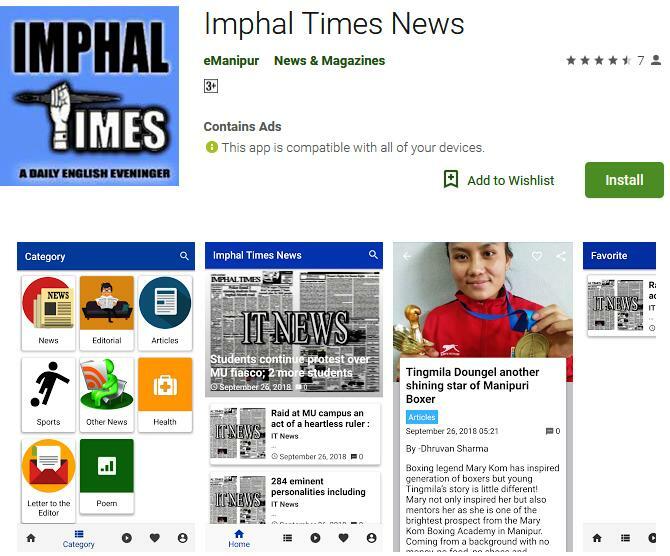 Governor of Manipur Dr. Najma Heptulla today launched mobile application ‘Heiya’ developed by Royal Apps at the auditorium of Manipur Film Development Corporation, Imphal. Dr. Th. Meinya Singh, Member of Parliament (Lok Sabha), Dilip Mayengbam, Station Director, All India Radio, Imphal, Prameshwor Singh, Executive Director, National Institute of Electronics and Information Technology and Akampat, Prabir Kumar Singha, Managing Director, Royal Apps were also attended as dignitaries in the launching function . “Royal Apps was established hardly a year ago, but it has already become a player to reckon with in the world of mobile and its vast possibilities. It gives me enormous satisfaction that the Royal Apps developed the mobile application ‘Heiya’ and I am fully confident that Royal Apps will be able to launch this application in major parts of the North Eastern Region within a very short period. The prime objective of ‘Heiya’ is to make the search for jobs by the jobseekers or the search of the jobseekers by the job providers much easier and without any cost. I am sure that the people of this State particularly the younger generation will get fully benefitted from this mobile application. More importantly, the Company has set an objective to design and fabricate user friendly mobile applications meant for the general mass to enable them to live a more complete, comfortable and meaningful life. I am fully confident that the Company, with their sincere efforts, will be able to achieve the objective. “It is very impressive that this mobile application ‘Heiya’ has two modules - Jobs and Entertainment. The Entertainment module has another eight sub-modules touching upon various issues such as General, Scientific, World, Health and it is designed in order not only to minimize the nuisance created by the rampant use of the current Social Media but also to give a completely new taste of Social Media. Apart from these modules, I am happy to learn that ‘Heiya’ is also going to add another four different modules in a very short period. The world has become virtually smaller with all these mobile applications and with a swipe one can be privy to any information of utility. “The Royal Apps also deserves praise for instituting the “Innovation Award” to be given every year to the Best Innovator who should be below 20 years of age. This award is introduced mainly to encourage the young men and women to innovate and carries an amount of Rs. 2 lakhs and citation. My heartiest congratulation to Royal Apps for this very meaningful and far reaching gesture. Education, Labour & Employment Minister Thokchom Radheshyam inaugurated the SBI, Tamei Branch, R. Tale Memorial Women’s market and laid the foundation stone of Model Residential School, at Tamei Head Quarter yesterday. The SBI, Tamei branch was reopened after 38 years. The Minister said that the people of Tamei and Tamenglong had been deprived of the basic benefits and development. He appealed to the employees posted in Tamei and Tamenglong irrespective of the post they held to render the best of their service to serve the people. He said that the people had suffered long enough due to lack of development in the district. He said that the inauguration of the bank and the market has given an opportunity to look into the prevailing problems and issues faced by the people to be able to work for the betterment. Assuring the people he said that he will put into words to the Hon’ble Chief Minister on the need to improve the road condition. Minister said that in terms of the infrastructure of schools there are certain plans in the pipeline to be carried out to improve the condition of the schools of the Tamenglong district and in the whole of Manipur which will be carried out according to the priority basis. He also highlighted certain development plans being intended to be carried for the Tamenglong district. MLA, 52-Tamei (ST) A/C Shri Awangbow Newmai said that for the people of the Tamei and surrounding villages the newly reopen SBI branch will help them ease in the difficulties in financial transaction. He added that reopening of the SBI branch will also help the people in getting the benefits of the several government schemes. He said that the residential school will also serve the best to the children from remote villages. Vice Chairman,MIDA, Shri o. Lukhoi Singh, Chairman of Tamenglong ADC Namsinrei Panmei, DC Tamenglong Shri Ravinder Singh, concern officials, village authority and locals were also present. The ministerial team also visited District Institute of Education and Training (DIET) Tamei Tamenglong, District.